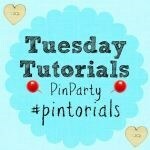 A huge welcome to Week 11 of the Tuesday Tutorials Pintorials Pin Party! How was your Mother’s Day? Did you get something nice from your children like a personalised card? My son drew me a Mother’s Day rainbow card, so this week I decided to feature rainbow related crafts. First up are these yummy looking rainbow cupcakes made by Mom On The Move. It really made my mouth water! Next is this lovely rainbow play dough made by Pre K-pages. I love how the rainbow coloured dough turns out. So bright and colourful. Last but not least is this beautiful St. Patrick’s day rainbow windsock made by Kitchen Floor Craft. Such a lovely idea! Don’t forget to pop by to take a look at Kate (DIY Paper Flower), The Boy and Me (STEM) and Hodge’s (10 Easter decoration ideas) blogs to see who is featured this week. First time joining us? Simply add your posts to the linky and they will be shown across all 4 of our host blogs (myself, ET Speaks From Home; The Boy and Me; Hodge Podge Craft and Craft on Sea) and then pinned to our group board. Each week the 4 of us will showcase a selection of three posts each to feature the round up on our blog along with the next weeks’ linky.